Ha’aretz is the oldest newspaper still in print in Israel. It began life in 1918 as an organ of the British military government, but was soon taken over by left-wing Zionists. The Schocken family bought the paper in 1935; Gershon Schocken was the editor and publisher from 1939 until he died in 1990, and his son Amos (72) has been the publisher since then. Some 40% of the ownership was sold during the past decade, but the Schocken family still solidly controls the paper. The Ha’aretz editorial policy is strongly on the left. Its 4% reach corresponds roughly to the 4% of Israeli voters that voted for Meretz, the farthest-left of the Jewish parties in the Knesset. 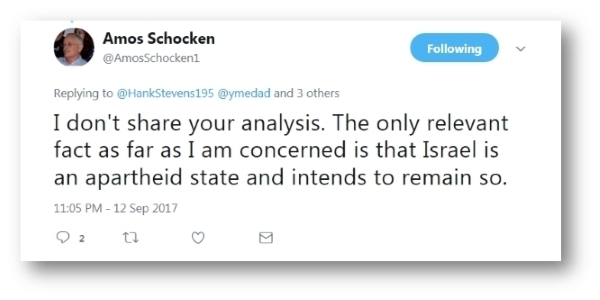 Schocken calls himself a Zionist, but the paper’s editorials and many of its op-eds place it in the anti-Zionist, anti-Israel category. Although he believes in “Zionism [as] a viewpoint that sees the national home in the Land of Israel as a solution for the Jewish people in the framework of a democratic, Jewish state,” his understanding of “democratic” implies complete equality in almost every respect between the Jewish and non-Jewish populations. But this definition (I argue here at length) vitiates the Jewish nature of the state, and if implemented the way Schocken and his writers would like, would result in a state that was neither Jewish nor democratic. The paper and its business section, The Marker, are widely read in the Israeli elite — including by people who loathe its politics — and sets the agenda in many policy debates. Outside Israel, stories that appear online in Ha’aretz in the morning regularly work their way on to the agenda later in the day as talking points in Washington and Brussels. Although it has a few regular columnists – Israel Harel and Moshe Arens come to mind – who could be called right wing, the paper employs such writers as the unspeakably vile Gideon Levy who accused Israeli pilots of war crimes, the Jewish Palestinian Amira Hass who believes that throwing stones at Jews is the “birthright” of Palestinians, and the anti-Zionist provocateur Rogel Alpher who advocates that Israeli Jews should emigrate, and called for a boycott of the “racist” Maccabiah Games. Is this the image of Israel that we wish to present to decision-makers in Washington and Brussels? Ha’aretz, particularly its English internet edition, plays a singular and important role in the international campaign to delegitimize and demonize the Jewish state. It serves as an Israeli Jewish voice to validate the worst accusations. Is Israel an “apartheid state?” Ask Hass. Does the IDF deliberately target civilians, especially children? Here is some “evidence” in a piece by Levy. Is Israel turning into an undemocratic theocracy? Here is Ha’aretz editor Aluf Benn saying so. It is true that Ha’aretz sometimes exposes abuses of members of minorities in Israel. But its moral failure is shown by its completely unbalanced coverage of terrorism and incitement among the Arabs of the PA and Israel, its total failure to understand the security implications of its recommendation to withdraw from Judea and Samaria, its consistent negation of the importance of maintaining the Jewish nature of the state, its disparagement of religious people and ideas, its hatred of “settlers,” and – above all – the pure contempt shown for the only Jewish state we have by the majority of its writers. There is room for left-wing media in Israel, much as I disagree with their positions. But there is no room for a publication that masquerades as “Zionist” while tearing down the state that gives it life. This entry was posted in Israeli Politics, Israeli Society, Media. Bookmark the permalink. I have never been able to understand what keeps this despicable rag afloat. With 4% of the Israeli market, I must assume that the paper is kept in business by nefarious sources from abroad. George Soros comes to mind. For some reason those outside of Israel still see Ha’aretz as the Israeli “paper of record”, much like the out-of-step NY Times, which long ago ceased to represent the typical American viewpoint.